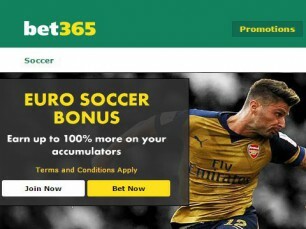 Bonus at Bet365 on multiple bets, valid for new and old customers: up to 100% bonus on accumulators in the best leagues in Europe as well as in the group stage and the knockout phase of the Champions League. Your multiple bets on Europe's football leagues are worth more at Bet365! This offer applies to returns on pre-match accumulators of 3 or more selections on Full Time Result or Result/Both Teams To Score markets for the Premier League, Serie A, Primera Liga, Bundesliga 1 or Champions League. This summary information does not dispense with consultation of the full terms and conditions of the bonus in the Bet365 page.